Winter is no longer coming: winter has come! Cold, rain, snow, wind and sun: are there any other weather conditions left to experience this week? 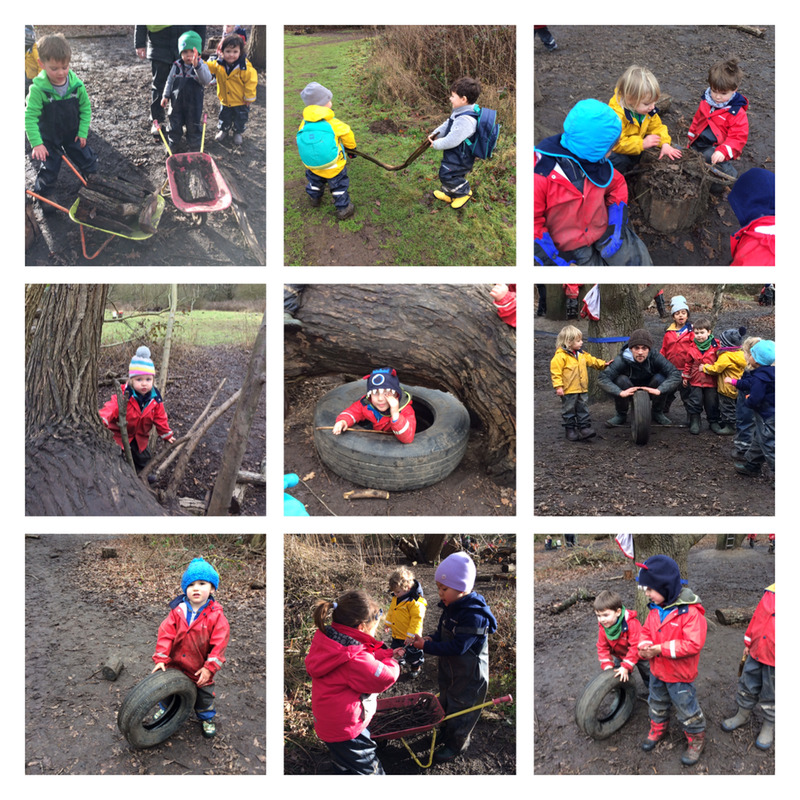 The children have been resilient and strong through everything the clouds could throw at us and came through with a gleeful grin and a desire to delve back into the woods for fun, frolics and frozen puddles! With rain, inevitably comes …hot chocolate! As the forest floor turned into a soupy brown cooking pot, the children’s culinary creativity burst forth to keep everyone happy and filled. Wheelbarrows of muddy hot chocolate did the rounds to children making up stories, children on the swings and any other children in the forest. Tree stumps of mud and sticks became cauldrons of steaming soup, mixed in a professional manner by many chefs – in this case too many cooks made a delicious broth. Ice-creams were also sold although the prices for these were extortionate! Tired of tyres? Not the Wimbledon children! Tyres in our forest have many uses from nests to bowling balls. The large tyre, while placed under a low branch, became the children’s cosy place from which to watch the world go by as well as fulfil any family role-play needs, whether the children were mummies and daddies, kittens and cats or anything else their imaginations wished to be. The smaller tyres had a less restful time of it, being almost constantly in motion as a bowling ball to knock down large log skittles, as a wheel for some machinery or simply being in the wrong place and the children needing it to be rolled away. We have had a recent upgrade to our tablet system which has caused a few teething problems with daily reports. We appreciate your patience while we adjust to all of the toiletting, food and sleep functions and hope to have everything working seemlessly soon. We know you will all be very excited about our upcoming Stay and Play week March 6th to 10th! The Doodle invites will be sent out next week so do look out for those. Next week is forecast to be the coldest week this winter. Brrrrrrrrr. Please follow our winter kit list recommendations. And in addition to normal kit list, can we please request that all children wear an extra layer on their top half, wear at least a double layer of socks, a hat and 2 pairs of gloves. 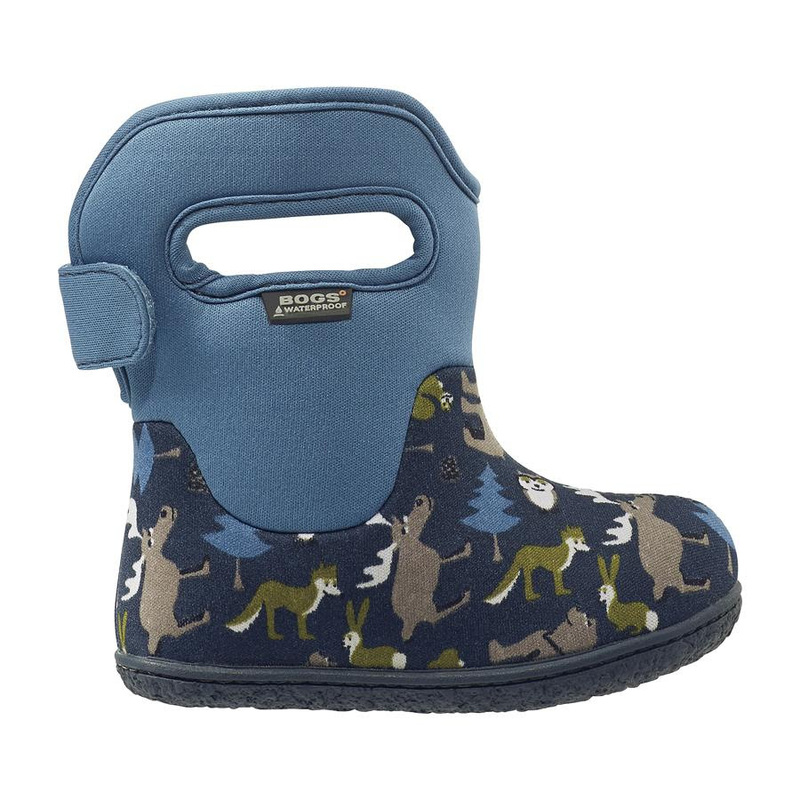 We have been trialling a pair of waterproof boots from Bogs Footwear for just over a month now and we're delighted to be able to fully recommend them for little feet in the forest. Not only do they look super snazzy but they are comfortable, durable, 100% waterproof and toasty warm too. Online at Bogs Footwear or in-store at Step2wo Biff in Dulwich, Olive Loves Alfie in East London and Windmill in Crouch End. Although we don’t have a current discount in place for our Little Forest Folk families just yet, we are working on it and we’ll let you know if we manage to get one. Sue has been associated with Little Forest Folk since the beginning as a temporary staff member but now that she's got a little more time, she'll be spending it with us and the children. If you haven't already met, then please do say come and say hi! Have a great weekend, we hope there's lots of snow for you to enjoy! Newer PostChiswick - Winter wonderland!